Dealership Service departments are often the go to resource for many vehicle owners that recently bought the vehicles. Unless the work you need is covered by a new-car warranty or manufacturer recall, use an independent shop, not a dealership. Following are the some of the reasons to opt for an independent shop over a dealership. Convenience: Independent Service shops are typically located with in 3-5 miles of your residence and offer courtesy shuttle services. This makes it easy to work around your schedules and get the repairs done as well. 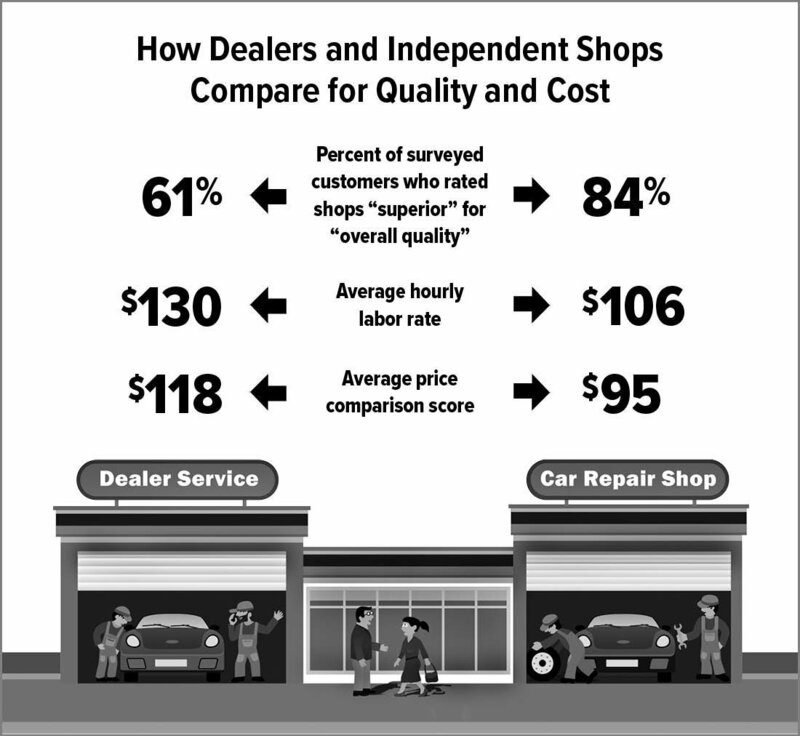 Cost: Dealership Service departments employ tens of people to serve the large number of cars that make to their shop. To cover the heavy costs of maintaining the staff and premises, dealerships charge heavy premium on the labor and parts comparing to what labor guides mandate. Their labor cost is at least 25% higher than independent shops. Customer Service: Dealership Service department employees do not worry about vehicles coming back to service as they get more than enough vehicles to keep them busy. This negatively impacts the customer service and trust. Service Times: Dealership Service departments get north of 100 vehicles a day with some of the vehicles requiring several hours of work. Some repairs take up to a week in a dealership.